Six hundred years before Christ, the inhabitants of the Ionian city of Phocea, having joined in the general, but unsuccessful, insurrection of the Greek colonies in Lesser Asia, against the Persian king, fled to their ships, and, rather than meet his vengeance, abandoned for ever the abode of their forefathers. They were long tossed about on the waves, and wandered to many ports in quest of a retreat, where they might enjoy the blessings of liberty, and the fruits of their industry: chance, or some reason unknown to us, brought them to the shores of Gaul, where they built a city, called Massylia. (..) Along the fine quay that lines it, the stir and bustle is prodigious; a moving picture that is enlivened by the great variety of dresses, the gesticulations and expressive countenances of the persons that compose it. The galley slaves, except when employed at work, chained in pairs, pass their time in a part of the quay, lying near the gallies, which are used merely as places of confinement. 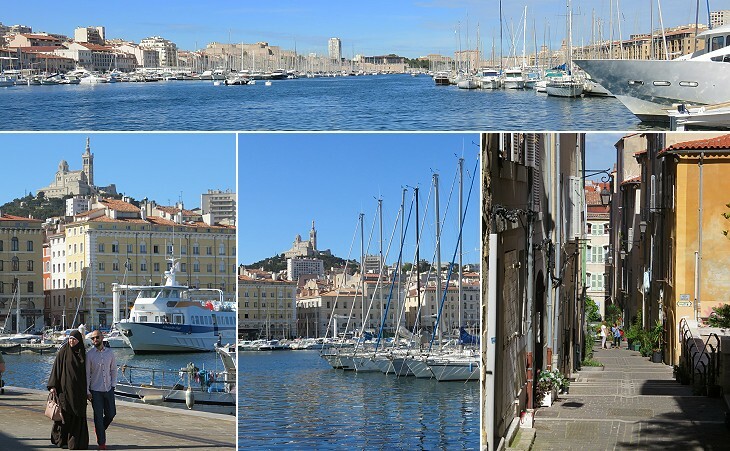 Swinburne described the foundation of Marseille by Greek settlers as a sort of Odyssey, but it was most likely motivated by economic and demographic causes, similar to the colonization of parts of Sicily and of Southern Italy. The Greeks chose this site because a wide natural harbour provided a safe shelter for their ships and the adjoining hilly peninsula could be easily fortified. 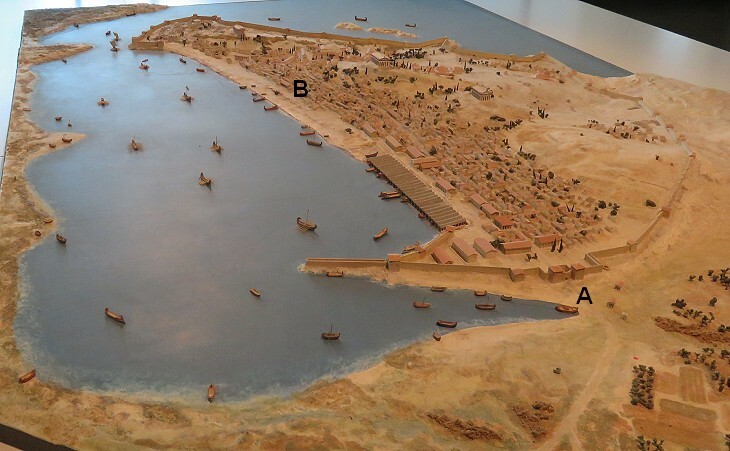 In the course of the XIXth century and especially after the French conquest of Algeria, a new harbour was developed to the north of the old one, which today is reserved for yachts and small boats. One would naturally suppose from the antiquity, opulence and importance of this Phocaean colony, that a great number of Grecian monuments would here be found nevertheless (..) the greatest part of the Greek marbles which decorate the museum were brought from Greece by travellers; they have nothing to do with this town and throw no light on its history. 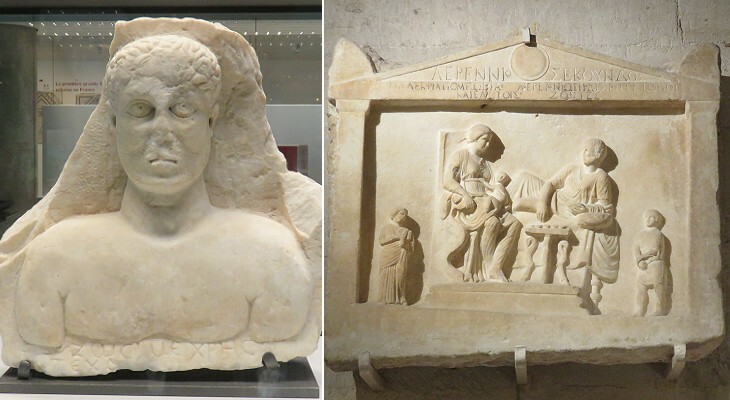 In spite of its wealth, power and progress in civilisation, the ancient city has left no remains of buildings, nor any traces of its existence beyond inscriptions (some in Greek), sarcophagi and a few fragments of sculpture. 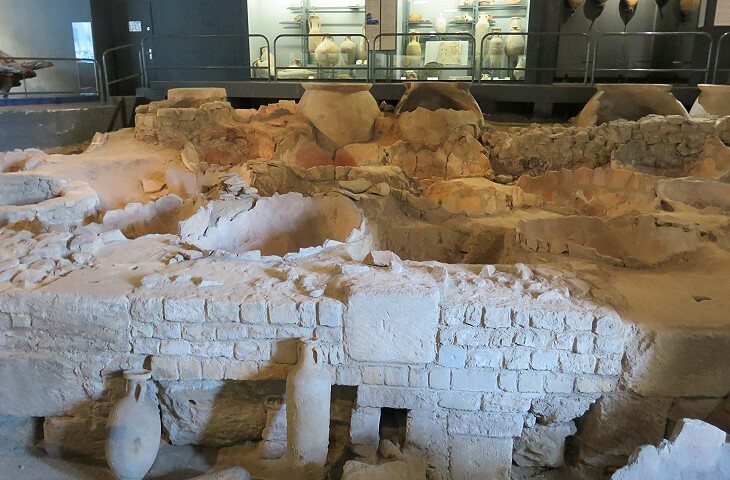 It was only when evidence of ancient constructions was unearthed after WWII, that archaeologists were able to formulate theories about the layout and aspect of Greek and Roman Marseille. 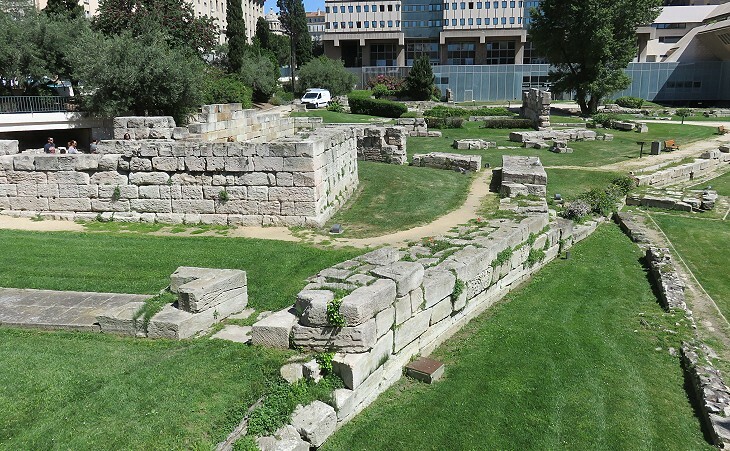 In 1967 excavations meant to lay the foundation of a large shopping mall led to the unearthing of ancient walls of different periods; they included remains of the eastern gate of the town and of some facilities immediately outside it, near the innermost part of the harbour. The discovery did not come as a total surprise because already in 1913 an ancient wall had been found in the basement of a house which was to be pulled down to make room for the shopping mall. A fine garden was designed to heighten the interest of the archaeological findings; their current aspect is the result of years of work to reconstruct them and is not fully indicative of their original locations, also because they were found at different depths of the ground. Jardin des Vestiges is an "outdoor hall" of the adjoining Museum of the History of Marseille, rather than a traditional archaeological area. During the reign of the Emperor Nero, the destinies of the medical art passed into the hands of Thessalus, (..) he was at last eclipsed in credit by Crinas, a native of Massilia, who (..) united in himself the pursuit of two sciences, and prescribed diets to his patients in accordance with the movements of the heavenly bodies, as indicated by the almanacks of the mathematicians, taking observations himself of the various times and seasons. It was but recently that he died, leaving ten millions of sesterces, after having expended hardly a less sum upon building the walls of his native place and of other towns. 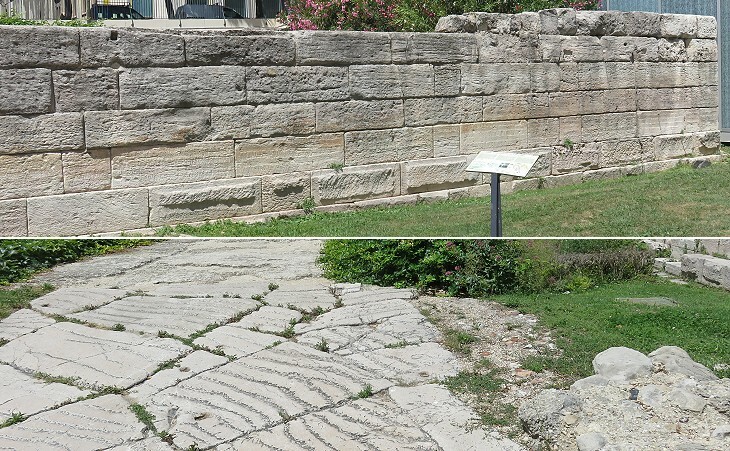 This wall was identified in 1913 and archaeologists immediately called it Wall of Crinas, because of a passage by Pliny. Its complete excavation allowed a more careful study of its features and it is now dated IInd century BC. 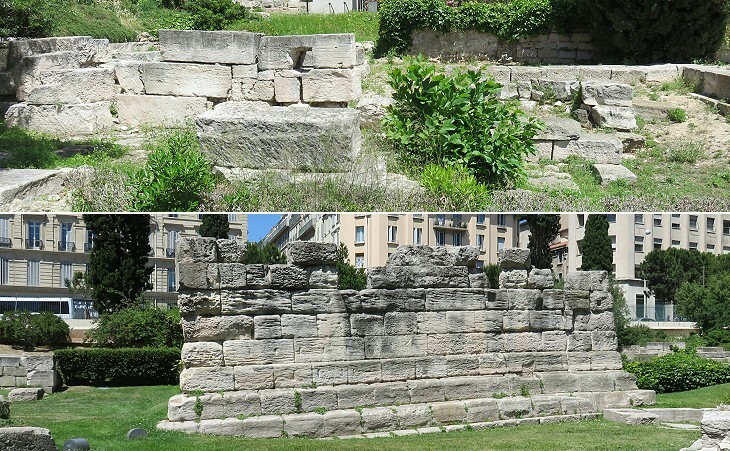 Archaeologists called the eastern gate of Marseille Porte d'Italie, because it was the end point of a branch of Via Aurelia, the mainly coastal road which linked Rome with Southern France. Excavations near the gate unearthed a small section of the paved road which was repaired in the IVth century AD. The ancient town was situated on a peninsula and it could be attacked by land only from the east, a fact which explains why so many parts of fortifications were found near the gate. The Greek colony established peaceful relations with the neighbouring Gallic tribes, but eventually its inland expansion through the foundation of trading posts (e.g. Avignon) and its wealth attracted the envy of the powerful tribe of the Salyes or Salluvii and Marseille called Rome for help during the Second Punic War. The terrace housed funerary pires which were built above a stone container for the ashes; it was decorated with triglyphs and metopes. Its use was discontinued in the early IInd century BC. 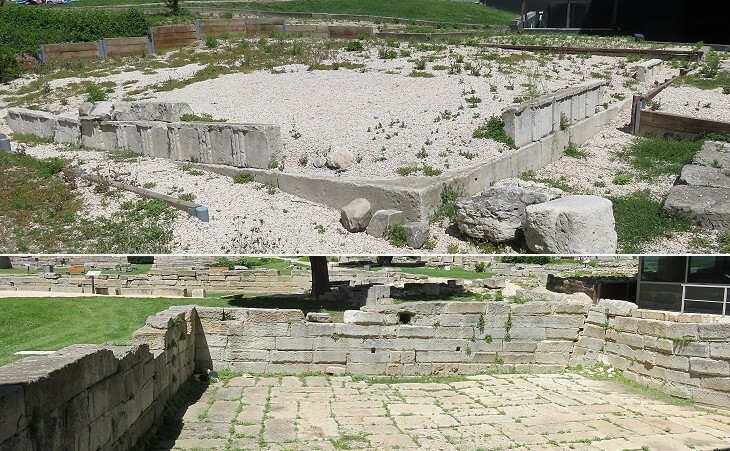 Another nearby funerary terrace was destroyed to make room for the shopping mall. The cistern was located very near the harbour and it is thought it was used to supply ships with fresh water. 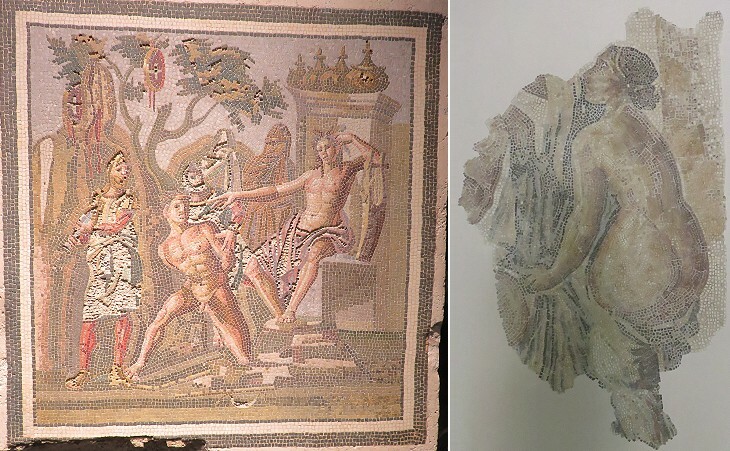 You may wish to see in the introductory page other exhibits showing the influence of the Greeks of Marseille on the Gauls of Southern France. 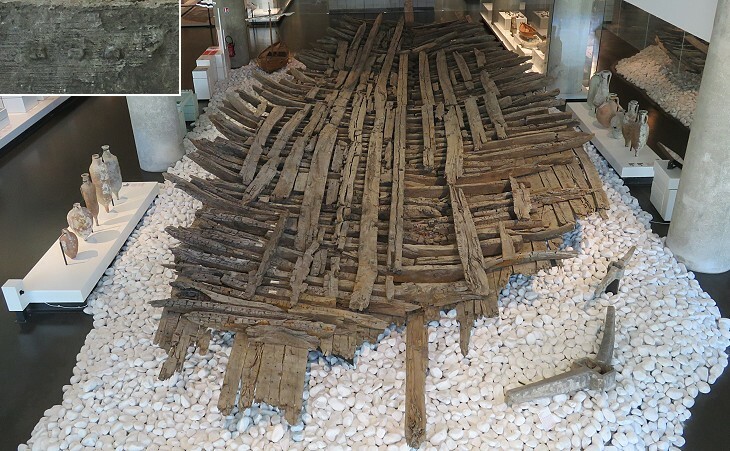 Archaeologists found the wreck of a large ship in the innermost part of the harbour; it appears that it was sunk on purpose because of a breakdown and then levelled. Roman Docks Museum: Roman "horrea" (warehouses) with "dolia"
This small museum houses a section of the horrea which were unearthed in 1947 when parts of the areas north of the Old Harbour were rebuilt after they were mined in 1943. 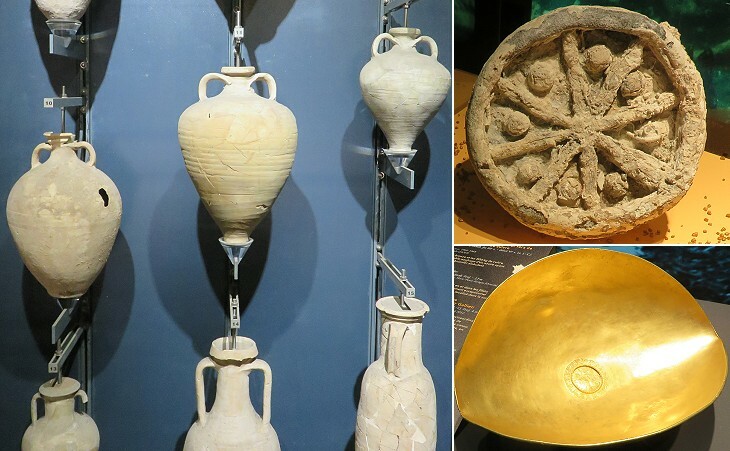 Dolia were large earthenware vessels which were used to store olive oil, wine and grains; they were partially buried in the ground to prevent excessive heat from damaging their contents. They can be seen also at Ostia, the harbour of Rome. 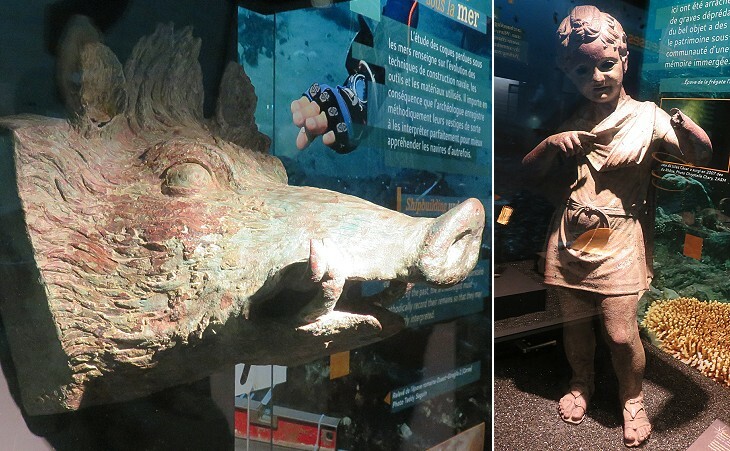 Snorkelling on the Mediterranean Sea might not be as fascinating as on the Great Barrier Reef, but instead of risking to encounter a shark one may come across the arm of an ancient statue as it occurred in 1972 near Riace in Italy. 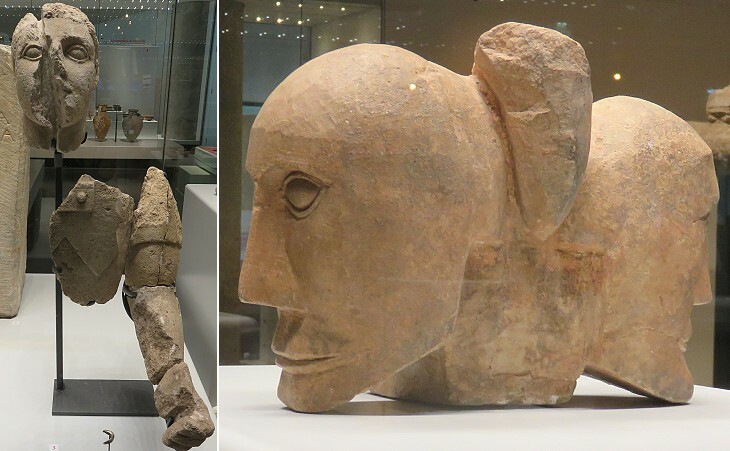 In May 2016 many ancient works of art and other interesting items which were found along the coasts of Southern France and of Corsica were on display in a temporary exhibition at the Museum of Marseilles, including a head of Julius Caesar from the Museum of Ancient Arles. 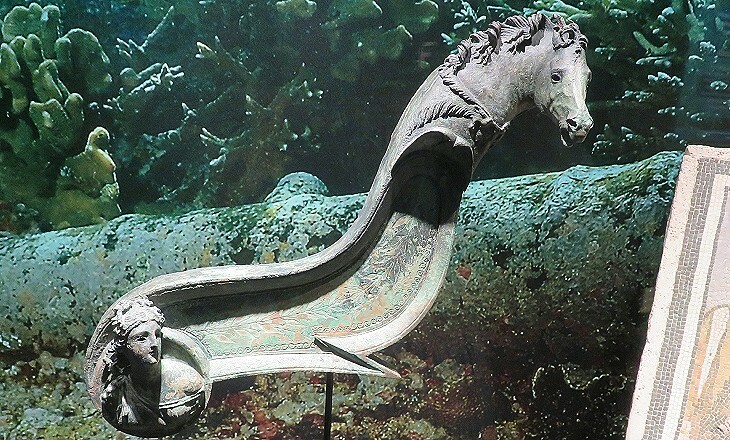 You may wish to see some bronze decorations of imperial ships which were found in the Lake of Nemi. The image used as background for this page shows a Ionic capital at the Museum of the History of Marseille.